When Mark Zuckerberg created Facebook, he wouldn’t have ever imagined that one day his platform will help colleges and recruiters in selecting suitable candidates by screening their social profiles on Facebook. Colleges and recruiters are surfing through your social media accounts to dig out the lesser known attributes of your personality that will help them select the right candidate for a course or a job. It should therefore makes sense for you to be aware about the elements in your social media profile that scoop out critical information about your overall personality to the outside world. Top educational institutes globally, look for a fine blend of aptitude and attitude when scanning admission seekers’ social accounts. The right aptitude matters but the right attitude is more desirable in getting admission in top college. A candidate having requisite knowledge or skill has to exhibit right attitude towards learning as well. Your social profile must reflect these attributes. It should also reflect values that your personal brand upholds. Balance professionalism with personality while posting photos and presenting opinions. Your social account should showcase your expertise or something that makes you stand you out from the crowd. Your personality matters a lot to colleges when it comes to evaluation of specific competencies for a course like how good or bad you are working in teams etc. Likewise, when a company decides to hire you, they would look for distinctive features in you to fill a particular position. Colleges might be interested to search for those aspects in your social profile that reflect consistency in personality. Your visual branding through personal photos help them to identify those finer aspects. The way you treat your social profile across social media accounts tells a lot about your psychology. It incidentally builds your public persona. Therefore, you won’t want to confuse people by sending overlapping or unclear messages / images from your Twitter, LinkedIn, Facebook etc. accounts. Avoid posting anything offensive or crude that may reflect negative sentiments about your temperament. Be true to yourself. Do not try to pose different just for the sake of it. You can convey a style statement but don’t show your attitude on the social network. Just make sure you’re also matching that up with the right aptitude on the other hand. The kind of engagement you do on your timeline expresses a lot about your individual brand image. The postings on it give a subtle sense of how you see yourself as an individual. Make sure to avoid posting or sharing photos that are unprofessional or too casual as it can spoil your public image. Your messages and comments should reflect a sense of greater responsibility on social media. Just because it is open and free should not give you the right to malign any issue or individual. Avoid sounding pretentious, instead, be straightforward about yourself and try to establish a professional demeanour across all your social accounts. Let the merit of your social engagement speak for itself, and allow visitors to recognize on their own what makes it innovative or interesting. Give your personal brand a complete makeover by keeping a professional approach to social platforms such as LinkedIn. Don’t go overboard customizing it to fake talent hunters. The professional network isn’t the place to post informal information. Although colleges do care about your creative expression but they don’t expect it on your LinkedIn profile. If you have a blog or any other work, try linking it out to your social media accounts, where you can show a lot more about yourself beyond what your resume might illustrate. In other words, following simple rules on social media can enhance your social image and give competitive advantage over others. Your social media connections can prove to be potential backdoor references in helping you land a job interview after course completion or getting internship opportunities. Your social network can be a valuable resource for establishing industry linkages. In that regard, colleges are keen to look for relevant and useful contacts in your social database. These can be connections you may have sometime worked with, industry experts you follow, interest groups that can give networking mileage or even recommendations / reviews acting as social proof for your skills and expertise. 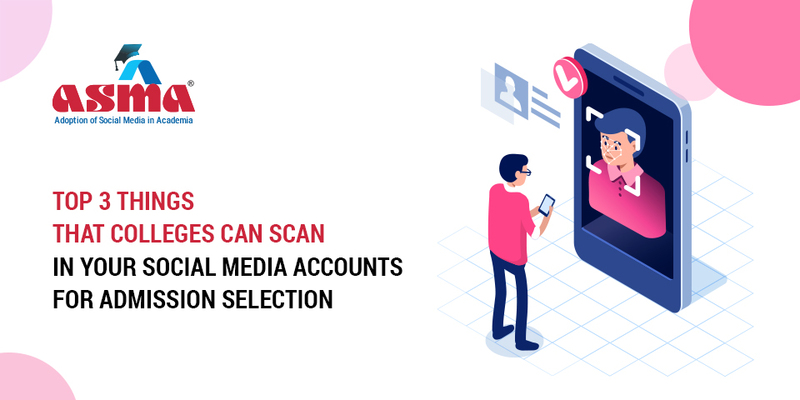 Many colleges believe social media recommendations to be a useful way of assessing a candidature as it provides unfiltered feedback of your work experience. Social media connections is a new way of doing due diligence; a comprehensive appraisal undertaken by a prospective alma mater to establish your true potential for an academic offering without having to invest time and money in it. It can give deep insights to spot potential takers. So, take some serious time out to build meaningful contacts that can add value to your career. In addition to the above stated points, do not forget to remember that for any educational institute you are not just a student but a valuable input resource to be groomed further for companies to recruit. It therefore makes sense for colleges to find additional reference points to crosscheck your credentials. And social media is an important one for them.